JMU closed the 2013-2014 regular season with an 82-71 loss to Hofstra on the road. Charles Cooke and Ron Curry each scored 15 points. Jackson Kent, starting in place of the suspended Andre Nation, hit double figures with 10 points. Andrey Semenov managed to lead the Dukes with 17, despite going 3 for 12 from behind the arc. Zeke Upshaw and Jamall Robinson paced Hofstra with 18 and 22 points respectively. As a team, Hofstra shot 55% from the field. The Pride’s efficient attack made the JMU defense look like it was missing a key piece. Oh, wait. Anyway, JMU finished the regular season 11-19 overall, and 6-10 in the CAA. The win got Hofstra to 9-22, (5-11). When the day began, JMU had a chance of finishing as high as fifth, provided the Dukes won and got some help. They didn’t get the help they needed and they didn’t win anyway. As they often have this year, JMU took a lead into halftime only to surrender it and lose after the break. I guess we can chalk that up to youth and inexperience, but it’s still frustrating. After being picked to finish 7th in the preseason, that’s exactly where the Dukes ended up. 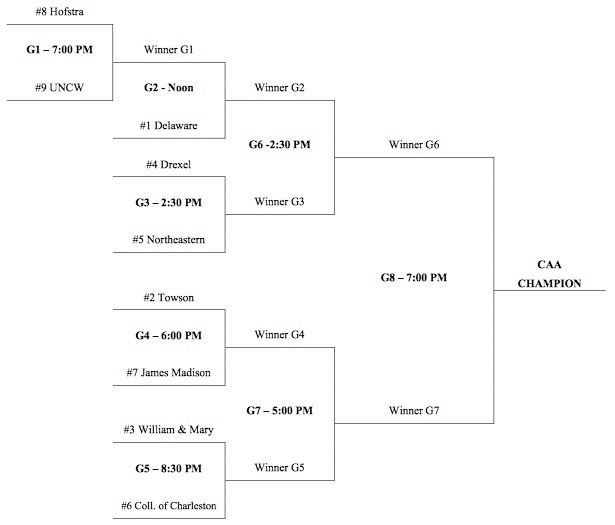 Their reward is a match-up with Towson, the second seed and best team in the tournament (in my opinion of course). With the tournament in Baltimore, Towson gets to play the role of pseudo home team. It’s a role that VCU rode to great success back in its CAA days. However, JMU played Towson pretty tough last week and could win. To do it, the Dukes will need to avoid one of those extended second half scoring droughts that have plagued the team all season. It also wouldn’t hurt to have a full roster and a lack of distractions. Keep your fingers crossed.